LOBSTER FANS, this is for you. From now till 31 May 2019, “A Tale of Twin Baby Lobsters” (双龙出海) debuts at Si Chuan Dou Hua Restaurant (‘SCDH’). You can look forward to unlimited servings of baby lobsters alongside 40 other Sichuan and Cantonese dishes. There will be 7 (seven) baby lobster dishes in under the unlimited servings ready to entice your taste buds. Stir-fried Baby Lobster with Fragrant Sichuan Spicy Sauce and Stir-fried Lobster in Sichuan Style represent the signature Sichuan style. Although both these dishes deliver similar peppercorn numbness effect, the difference comes in the strength of the aroma. 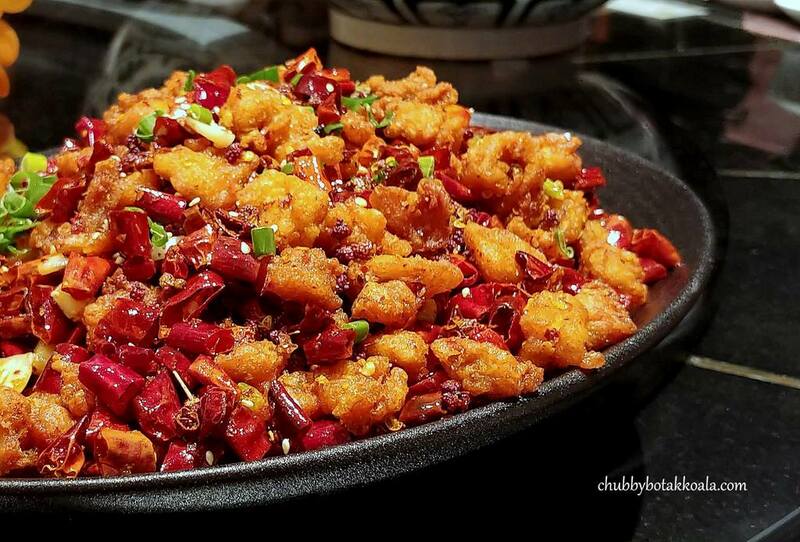 The aroma of the Fragrant Sichuan Spicy Sauce is more distinct as it uses a special peppercorn. The aroma really draws you to try this dish first. Chubby Botak Koala spicy meter 9/10. Sautéed Baby Lobster with Dried Chilli. A tone down version of Stir-fried Baby Lobster with Preserved Chilli and Chilli Padi. It is still spicy; however, it is still manageable. Chubby Botak Koala spicy meter 8/10. One of my favourite Chinese sauce is XO sauce. I was very happy when I saw Baked Baby Lobster with XO Sauce. The flavour of the XO sauce is solid; however, it seems all that goodness of the sauce did not penetrate evenly into the flesh. Probably due to the dish being baked instead of stir-fried. In the end, I took out the flesh and rub it with the XO sauce that coats the exoskeleton to even up the flavour. Chubby Botak Koala spicy meter 5/10. Stir-fried Baby Lobster with Ginger and Onion. My favourite dish of the evening. The baby lobsters are coated with flour, deep fried to seal the juice and stir-fried with aromatic ginger and onion. I find the combination of spring onion and ginger, really wakes up the natural aroma of any crustaceans. In this dish, once the essence of the lobsters mixed with ginger and spring onion, making this dish so enticing. If the chef tossed in some egg noodle like mee kia or it will be heaven. Chubby Botak Koala spicy meter 0/10. Baked Baby Lobster with Superior Soya Sauce. One of the popular Asian prawn dishes that will make you polished your bowl of rice. The same applied here, the superior soya sauce coated the lobsters. The flesh soaks up the sweet soya sauce, making me search for a bowl of white rice. Unfortunately, as there were more dishes to try, I restrain myself. Chubby Botak Koala spicy meter 0/10. 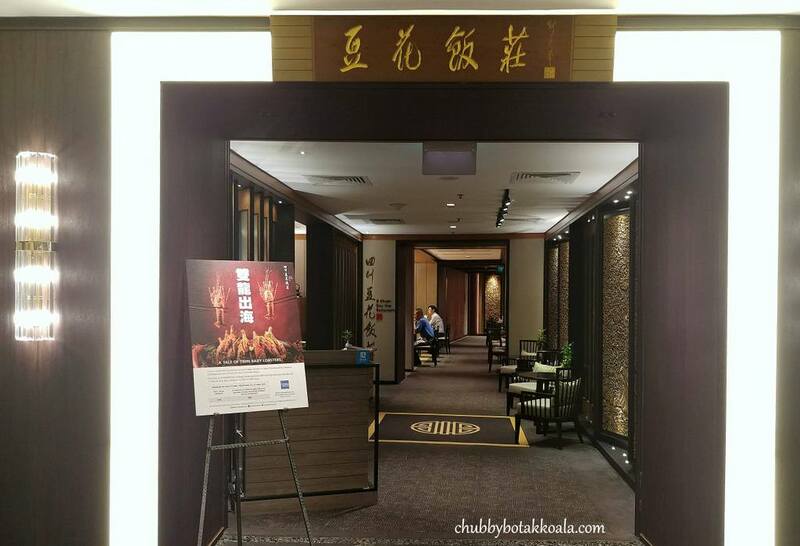 For “A Tale of Twin Baby Lobsters” ala-carte buffet, there will be a one-time order dish created specifically by TOP of UOB Plaza and PARKROYAL on Beach Road. Baby Lobster in Preserved Wild Chilli served with “Man Tou” is the signature dish at TOP of UOB Plaza. The Man Tou is deep fried, filled with the baby lobster. The Man Tou is crispy on the outside and fluffy in the inside, while the lobster flesh is delicious. The lobster with Preserved Wild Chilli has a bit spiciness, but it should be palatable to most people. SCDH version of yummy Lobster Roll. Chubby Botak Koala spicy meter 6/10. Over at PARKROYAL on Beach Road, Executive Sichuan Chef Zeng Feng created Crispy Noodles with Baby Lobster. The baby lobster is cooked with lobster broth that has been boiled down along period. Once it’s ready, it is poured on top of the crispy noodle, resulting in excellent dish combining the crispy texture of the noodles with juicy baby lobster flesh. Chubby Botak Koala spicy meter 0/10. Prior to us devouring the 9 unique lobster dishes, we started the meal with cold appetizer and soup. 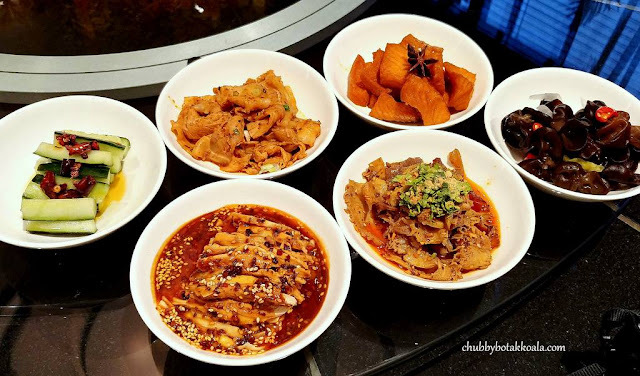 The cold appetizer consists of Shredded Chicken with Sesame Sauce, Sliced Beef and Tripe in Chilli Sauce, Sliced Pork with Minced Garlic and Chilli Sauce, Smoked Fish with Mixed Spices, Marinated Black Fungus with Preserved Chilli and Marinate Chilled Cucumber with Dried Chilli. Of these six-cold appetizers, I like the shredded chicken and sliced beef and tripe most. Both dishes have a strong flavour, with a manageable spiciness level and the meat is tender and succulent. Double-boiled Fresh Fish Maw in Imperial Consommé is a must try. The collagen filled soup is robust with a touch of sweetness from the wolfberries. The fresh fish maw is crunchy and springy, definitely suits my palate. It really warms up my tummy and prepares it for 9 lobster dishes. Executive Sichuan Chef Zeng Feng also served SCDH signature “Chong Qing” Diced Chicken with Dried Chilli. This menacing looking dish is the SCDH version of Pop Corn Chicken. I took a bit of it and I reach for my drink again in a flash. Only for those that can stand super spicy chilli dish. Chubby Botak Koala spicy meter 13/10. “Chong Qing” Diced Chicken with Dried Chilli. 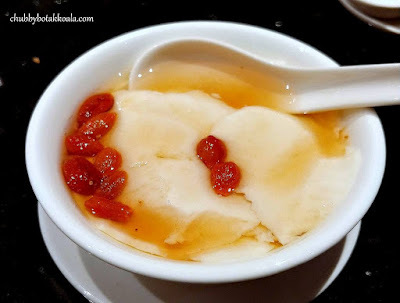 Dessert is the SCDH signature Homemade Fine Beancurd. The soft, smooth and velvety beancurd, is easy to slurp and nicely swirl in the mouth. The sweetness of the wolfberries added a unique sweet flavour in this dessert. Definitely, a must order at SCDH and the best part you can order other desserts as well. Overall, I was definitely impressed with the spread of baby lobster dishes. There are dishes to accommodate diners with different spicy tolerance and best of all are the baby lobsters are fresh. I don’t think you can try all the dishes in one seating, so it is great that you can get a 30% discount on a visit to the second outlet. Cheers!! 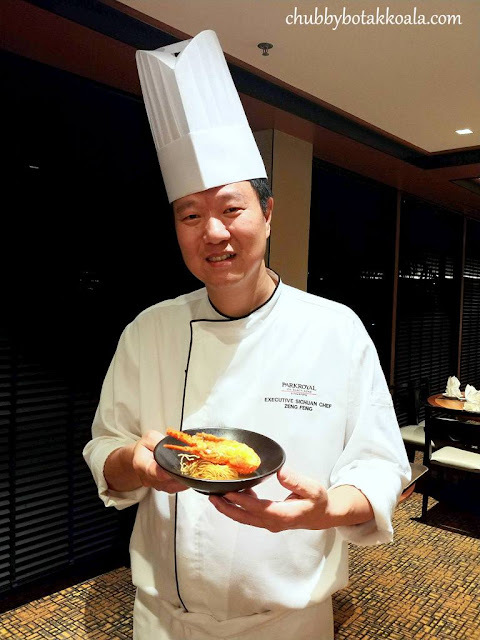 Executive Sichuan Chef Zeng Feng created Crispy Noodles with Baby Lobster. Dinner, Fri to Sun: $88 per adult. Children from age 6 to 11 will be able to enjoy the buffet at half the adult’s price. Guest who dines at one outlet will enjoy 30% savings when they dine at the second outlet. For the full menu for TOP of UOB Plaza, please click here. For the full menu for PARKROYAL on Beach Road, please click here. Thank you very much PARKROYAL on Beach Road and Si Chuan Dou Hua team for the tasting invitation. Congratulations to Si Chuan Dou Hua PARKROYAL on Beach Road outlet for winning the Silver category of The Strait Times and Lianhe Zaobao 联合早报s Best Asian Restaurant 2019.